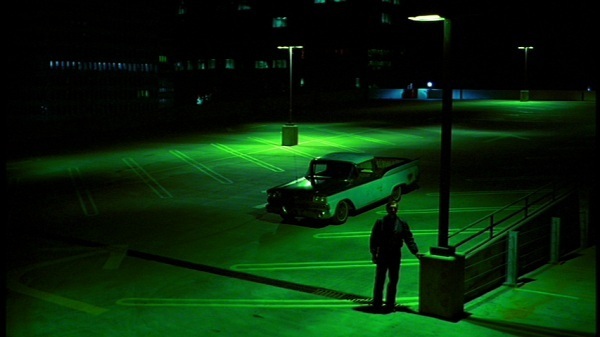 Paris, Texas (1984) arose from the unlikely pairing of New German Cinema director Wim Wenders and the American award-winning playwright/poet Sam Shepard. 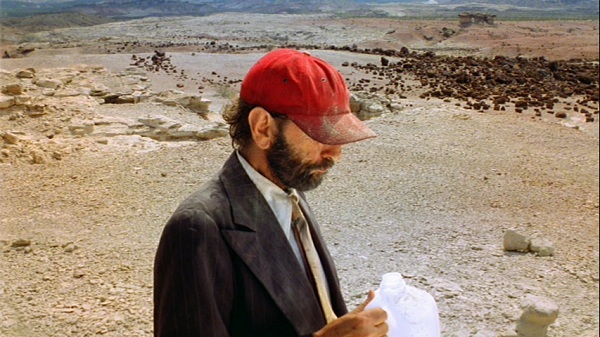 Set entirely in the American Southwest, the film opens with mythological overtones as an eagle in flight spies the lone Travis (Harry Dean Stanton) traversing the expanse of Big Bend. Ry Cooder’s slide guitar chimes in with a rendition of Blind Willie Johnson’s Dark Was the Night, Cold Was the Ground, as if to formally announce that this myth is the stuff of the great blues songs – one of America’s unique art forms. We immediately notice that Travis is walking – not like the vagabond he resembles, but like he has a purpose to escape “every sign of man.” And we eventually learn that he has been caught in this endless loop of catatonic consciousness for four years – the origin of which lies with his wife, Jane (Nastassja Kinski). As luck or fate would have it, Travis runs out of water, and his search takes him to an isolated service station where he collapses. The mute Travis is nursed back to health by a country doctor (Bernhard Wicki). The doctor finds a card in Travis’ pocket and contacts his brother Walt (Dean Stockwell), who lives in the suburbs of Los Angeles with his wife Anne (Aurore Clément) and Travis’ son Hunter (Hunter Carson). The first act of the film is dominated by Walt’s thankless efforts to bring Travis back to civilization (or at least, southern California). Gradually, Travis recovers pieces of his memory, although Travis also plays his cards close to his chest. (Hunter had been left at Walt and Anne’s doorstep at the age of three, and neither Walt nor Anne were privy to what actually happened since Jane also went missing at the same time.) Within a short time, Travis builds a relationship with his son, and together they set out to Houston to find Jane. Travis eventually tracks Jane down to a club where she works. The basement of the club holds rows of large booths where a male client, hidden behind one-way glass, can speak via phone/intercom to an attractive women in an adjacent theme-inspired room wearing the theme-appropriate attire. Travis eventually manages to find Jane in the “Hotel” booth (echoing the inspiration for the film’s narrative, Shepard’s Motel Chronicles). Jane offers, “If there is anything you would like to talk about, I’ll just listen, alright – I’m a real good listener.” Travis tries to determine if there is more to Jane’s menu of services than mere talk and a peep-show. Without knowing who is on the other side of the glass, Jane assures him that if he is interested in meeting outside the club, she can find a girl willing to do so – but she is not that girl. Nonetheless, the experience becomes too much for Travis, and he and Hunter head back to California. Following a revealing conversation between Travis and Hunter about Travis’ father that evening, Travis has a change of heart and returns to Houston. Leaving Hunter at a hotel (having said his goodbyes in the only way he is capable), Travis visits the club again. After the unsuspecting Jane enters the “Diner” booth, Travis turns his chair away from the window with phone in hand and begins to tell their tragic tale. But the story is told in the third person – in part as a reflection of Travis’ own detachment from the past and in part to explain his own emotional perspective in a way that probably could not be accomplished otherwise (e.g., a face-to-face meeting in a real diner over coffee). It is a tale of the dark side of love. For Travis, blessed with the affections of a beautiful girl less than half his age, the adventure turned to obsession and then to jealousy. For Jane, the new intoxication of that adventure with a father figure who worshiped her soon became a cage, and having a child with her captor only galvanized the bars. As Travis could never fill the bottomless pit, new intoxicants were introduced. 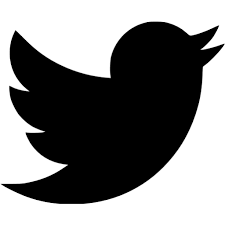 Tepid resentments festered into a fiery hatred. But in the midst of what Robert Ebert characterizes as one of the greatest monologues in film history, we see very little of the speaker. 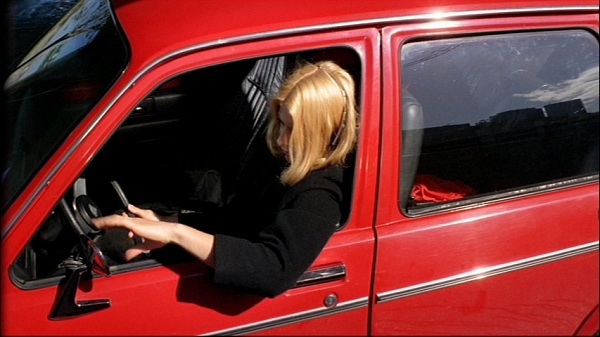 Rather, with mercilessly lingering shots, Wenders exhibits the faith in Kinski to let her reactions provide the heft. Whereas most narratives focus on the melodrama of love gone bad, Wenders and Shepard choose to consider the aftermath – the weeds of the psyche slowly emerging from beneath the ashes. 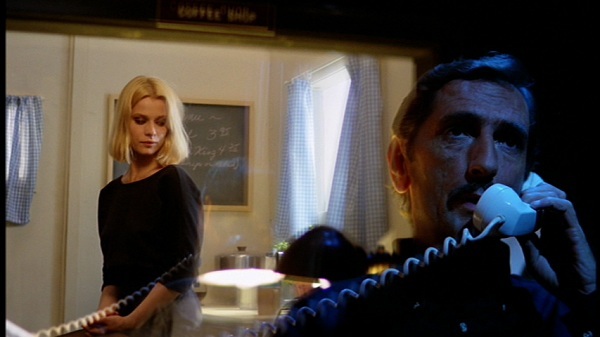 Although Paris, Texas is often classified to as one of Wenders’ several “road movies”, it is actually a story of a person who steps off the road – even if only for a time. Wenders himself cites The Searchers (1956) as an inspiration, which has led some cinephiles down the rabbit hole of considering why Wenders named the main character Travis (Robert DeNiro’s character in Taxi Driver (1976), another film inspired by John Ford epic). But in final analysis, the film proves to be a contemplation on the deconstruction of the initial dreams, and the ultimate sacrifice of, parenthood. Breaking his silence for the first time in the film, Travis’ first word is “Paris” – a reference to both his own father’s idyllic version of his mother and a vacant lot where Travis planned to move his family after their son was born – both of which prove to be elusive. On Travis’ first morning at Walt’s home, his first order of business is connecting with Hunter by walking him home from school, and as Travis fails, he seeks the advice of the housekeeper on how to “look like a father.” When Travis first interrogates Jane in the Hotel booth, his old jealousies are mixed with a genuine concern about Hunter’s future well-being. It is no accident that the final scene between Travis and Jane begins in a place where Travis’ face cannot be seen. The peep-show booth proves to be a confessional, and Travis is the penitent. Without being explicit, Travis forgives Jane and asks for Jane’s forgiveness – an implied plea to stop punishing herself and Hunter for the damage he caused in the past. But unlike most film narratives, the effect of true contrition is not overplayed. Travis, Jane, and Hunter will not build that house in Paris and live happily ever after. Although Travis does find a connection with Hunter as they set out to find Jane, it does not change the fact that Travis is too damaged to be the parent that Hunter deserves. Sometimes it is better to have just one parent. So once Travis convinces Jane to be a mother again, he literally fades away into the darkness. … and at that moment, before returning to the road, Travis assumes the role of benevolent observer (a character tragectory that would be reversed with the angel Damiel in Wenders’ Wings of Desire (1987)). 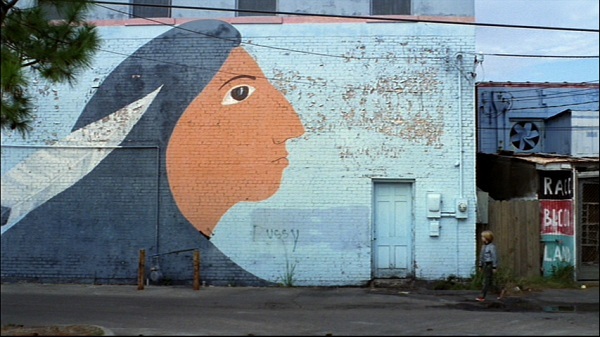 This winner of the Palm d’Or at the Cannes Film Festival was shot entirely on location – places that were carefully scouted by Wenders himself (as documented in his book Written in the West). Although the cinematography by Robby Müller (Mystery Train (1989), Breaking the Waves (1996)) is far from audacious, as its title suggests, the film is undoubtedly a testament to how Wenders as a European visual artist first came to experience America. (Despite the setting, Clèment and Wicki do not hide their French and German accents.) 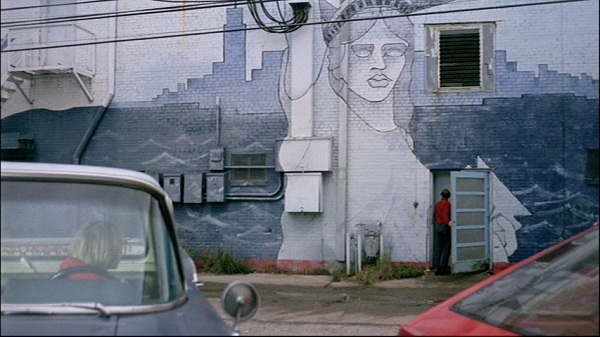 To be sure, Wenders’ relationship with America would continue to evolve (The End of Violence (1997), Land of Plenty (2004)). But it is clear from his first film set in America that he was instantly infatuated with the visual oddities of the Southwest and the contradictions that underlie the character of the United States. From this cinephile’s perspective, Wenders’ career turned into something of a heartbreak. He directed his first feature film in 1970 and realized growing critical success throughout Europe for a decade. After a storied and disappointing collaboration with Francis Ford Coppola and American Zoetrope for his first English-language film, Hammett (1982), the quality of Wenders’ work reached a crescendo that began with the award-winning The State of Things (1982) and ended with the fan-favorite Wings of Desire. And armed with his biggest budget yet, Wenders next indulged his ambitions with the genre-bending epic Until the End of the Word (1991) – a commercial flop which was drastically cut from an original runtime of 280 minutes and has always split the opinion of his fans. But over the last two decades, critical attention of Wenders’ work has been limited to two documentaries – Buena Vista Social Club (1999) and Piña (2011) – despite the fact the he has also directed eight feature films starring the likes of Dennis Hopper, Tim Roth, Sarah Polly, Michelle Williams, Mel Gibson, Milla Jovovich, Bill Pullman, Gabriel Byrne, Irene Jacob, and John Malkovich. After Million Dollar Hotel (2000) proved that Bono’s role in Wenders’ films should be confined to the soundtrack, U.S. distributors and critics largely ignored Wenders’ feature films, and perhaps rightfully so. No matter. 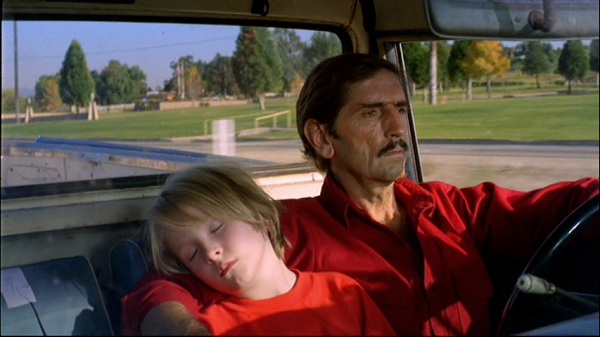 Wenders gave us the true masterpiece of cinematic storytelling that is Paris, Texas.